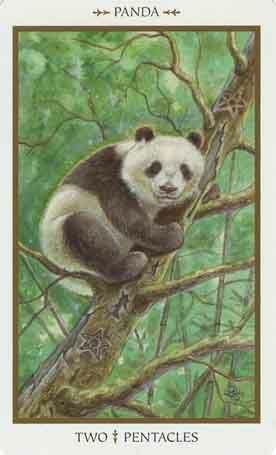 Symbols*: The panda is climbing an old tree. It is trying to reach some bamboo shoots growing in the midst. The tree begins to lean and the animal must decide whether to continue on its quest for the bamboo or retreat to the safety of the forest floor. It is perched between two pentacles that are carved in the bark. If the panda proceeds with caution, it may be able to realize its goal. But if it becomes overzealous, it could sabotage its mission and cause the tree to come crashing down. The panda must decide how far up it can venture. It must follow its instincts and try to remain balanced on its perch. Description*: You have a difficult choice to make in the near future. It will be important to consider both options carefully before deciding which situation would best suit your needs. Having to make choices is part of life and can help us to become more aware of the necessity to maintain balance as we expand our horizons. What may seem like a sacrifice or a compromise now may result in a more harmonious situation in the future. Possible Meaning: You have a difficult choice to make in the near future. You need to balance between two situations in your life, perhaps they’re opposing forces. There will be a change ahead in your life, one way or another. Through balance, you will find yin and yang – you will be more centered. Thoughts/Points to Ponder: This panda looks gently at you, he’s sitting on a branch of tree as if he’s waiting for your move. He’s climbed up there to make a stand for something, and he won’t budge until you have made that decision. He asks you to listen to your inner-self, to listen to the wind gently swooshing by. Panda gives you the gift of gentle strength. Since a Panda's diet consists of 99% bamboo, the study of bamboo is very important to this totem. Bamboo has strength yet flexibility. Therefore, both the Panda and bamboo reflect a quiet, unassuming essence - one that is modest and strong at the same time. Panda reminds you that it is very important not to take on more projects than you can handle. Be sure to fully develop a project before taking on a new one. Focus is the key to all your endeavors. Panda also warns you not to be narrow-minded and to see things only in black and white, right or wrong. Look at things from a different perspective and remember that there are many shades of gray in-between.